Life on the road calls for a trucker's wallet with compartments to carry all of your essentials. Whether you are actually a truck driver or you simply want the convenience of a trucker's wallet with compartments, this popular style of wallet will come in handy. What Is a Trucker's Wallet? If you haven't seen one up close, you may be wondering exactly what a trucker's wallet is. Because truckers spend the majority of their day sitting on a seat, having a wallet in the back pocket can create some pretty intense discomfort over time. Some truckers have even complained of potential back problems from sitting on a lumpy wallet 12 or more hours every day. Enter, the trucker's wallet. A wide and long black wallet that resides on the seat next to you, but is attached by a chain so you don't walk off and forget your important items, like your license, credit cards and money. Another nice feature of trucker's wallets includes the chain. If someone tries to steal your wallet, the chain is attached and will give you a quick tug. You'll immediately know that someone is trying to take your money. The inside of most trucker's wallets have compartments for all those important items you need when you spend at least half your life on the road. Unzip and open a trucker's wallet and you'll find compartments for items like your driver's license, credit cards, money (both coins and bills) and other paperwork, like your CDL license. Leather Chain Wallet is a bit smaller than some of the other trucker's wallets with compartments, but the price is right and the material is high quality, which means this wallet will last for years. Amazon offers a lot of different styles of trucker wallets, including this simple design with just a single compartment. You'll also find a Deluxe Trucker Chain Wallet if you have a bit more to carry than the smaller wallet will hold. Quality: Not all leather wallets are made equally. Some weather smells better, feels better and wears better. High quality leather should be soft and supple and have a pleasant smell. Size: Make sure you purchase a wallet that will be large enough to hold all the items you might need while you're away from home. Trucker's wallets come in a wide variety of sizes. 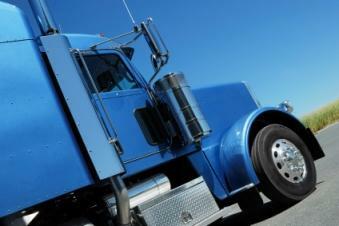 Chain: The chain is a vital feature of the trucker's wallet. Make sure the chain on the wallet you are considering is sturdy but not so heavy that it will be uncomfortable to carry. Number of Compartments: Make a list of the items you carry in your current wallet and compare that list to the new trucker's wallet you want to purchase. Is there a space for each of your items you currently carry? Will everything fit in the new wallet comfortably? If you are a truck driver, then one of these wallets is a vital piece of equipment to help you do your job well. However, if you are not a truck driver, you may still want to consider one of these wallets to help you keep track of your personal belongings without creating bulk in your back pocket.